Based in Beijing, China, CNKI (China National Knowledge Infrastructure) is a leading provider of academic resources, knowledge service and integrated solutions with 25.000 participating institutions and 20 million individual users. 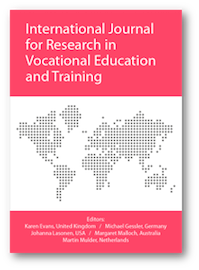 CNKI and the International Journal for Research in Vocational Education and Training (IJRVET) signed in march 2017 a contract for inclusion. All IJRVET articles will soon be available in China.